The torturous situation caused by TV star and far-right conspiracy theorist Roseanne Barr, whose 90s-era show Roseanne was revived for 2018 in some kind of horribly misguided effort to appeal to Donald Trump supporters, culminated in a predictable implosion this week. Barr—who has been tweeting for months about the 4chan-born Qanon theory that ludicrously alleges Democratic leadership are members of a Satanic pedophilia cartel—sent out a racist tweet smearing Barack Obama adviser Valerie Jarrett, resulting in the show’s abrupt cancellation by ABC. Starting tomorrow, syndicated episodes of the recently revived sitcom — which was axed by ABC earlier today after racist tweets from star/co-creator Roseanne Barr ignited a social media firestorm — will no longer run in rotation across the channels. In fact, Hulu seems to have jumped ahead of its own stated termination date. As of Tuesday evening, the show is listed as “Currently Unavailable” on its streaming website. “We support ABC’s decision and are removing the show from Hulu,” a Hulu spokesperson told Hollywood Reporter. The site also noted that Amazon “still has SVOD rights to seasons one through nine of the original series.” As of Tuesday evening, both the original seasons and the revival remained available to purchase there. 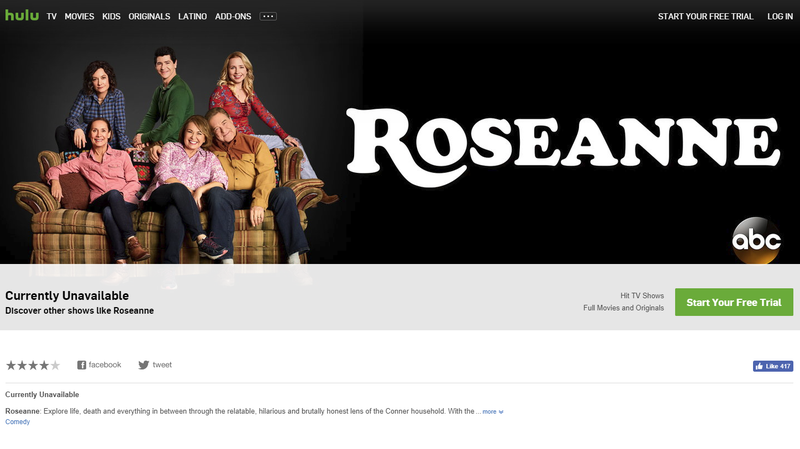 According to Deadline, ABC has additionally halted its campaign to promote Roseanne for the Emmys, and all promotional materials for the show have been yanked from websites belonging to it and Disney, one of Hulu’s owners. In retrospect, this all seemed inevitable, given Barr’s Twitter feed has been filled with all manner of vile racism and bigotry for a decade. It’s possible this singular tweet was the reason for the cancellation. But the speed by which many of those involved in the production and distribution of the highly-rated show are distancing themselves seems to suggest that ABC had realized the Barr situation was reaching a boil prior to Tuesday, though perhaps not until after they signed for another season in late March. Entertainment and employement lawyers told Law & Crime that while Barr’s contract probably contained a “morality clause” requiring her to maintain an acceptable degree of public decorum, ABC could still be on the line to pay out talent and crew who signed on to the revival and the next season. So if TV executives miscalculated how toxic Barr was and would continue to be under the spotlight, that was a disastrous mistake—albeit one that is deserving of no sympathy whatsoever.